A trip to the borders ensued for this surveying site – with Peebles being my destination. 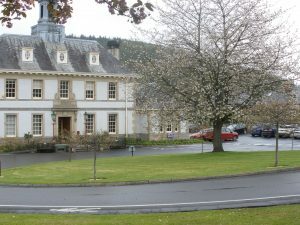 After a beautiful but rather bumpy breezy trip on the front seat of a double decker bus with a poorly fitting front window, I make my way through the back streets of Peebles to the local council and police station grounds. I expected this to be a cleaner air site and therefore lichen identification to be a tad more challenging due to increased diversity of species. I am not wrong. Although it doesn’t have the mind-boggling diversity of lichens found at the nearby Dawyck Botanic Garden, it certainly does have a richer community of lichens than I have found at many of my urban sites. 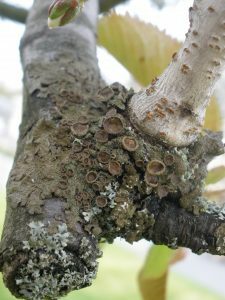 The tree trunks are dominated by a healthy population of Hypogymnia physodes (less pollution tolerant) and Parmelia sulcata as well as Parmelia Saxitalis, with only a tiny amount of the nutrient-loving Xanthoria species creeping in. I also found the very beautiful Melanohalea exasperata on the twigs of one of the trees. I was excited to add a new species to my survey lists so far – Hypocenomyce scalaris, a scurvy looking fellow hanging out at the bottom of one of my survey trees. And on the ground in amongst the grass near my survey trees, a glorious covering of the leafy (foliose) Peltigera lichen (commonly known as the Dog Lichen due to it’s fruiting bodies – sexual reproduction, looking at little like dog’s teeth – it was thought to cure dog bites according to the Doctrine of Signatures). There are aproximately 91 species of Peltigera in the family Peltigeraceae. 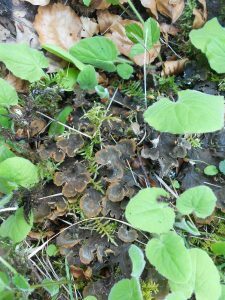 Peltigera often grow on soil (terricolous), but can also occur on trees, rocks, moss and a variety of other substrates in many parts of the world. They provide vital micro-habitats for a wide variety of wildlife and add important biodiversity to a grassland or lawn.